Play the God of Wealth Pokie 30 Free Spins on Friday! Friday is finally here so it's time to celebrate at Fair Go Casino with 30 Friday free spins! Redeem the bonus code WEALTHY30 to claim your 30 free spins and win up to $180 if your last transaction is a completed a deposit this week and you deposited $50 or more for the week. February depositors can also claim a $25 free chip loyalty bonus with the coupon code LUCKYFEB25, but do not claim two free bonuses in a row. While you are at it, try a few spins on the new Wu Zetian pokie. Good luck! Deposit Monday to Thursday and Get 30 Free Spins every Friday! Free Spins Game: God of Wealth. $50 minimum deposit per week. Standard free bonus rules apply. 60x wagering. 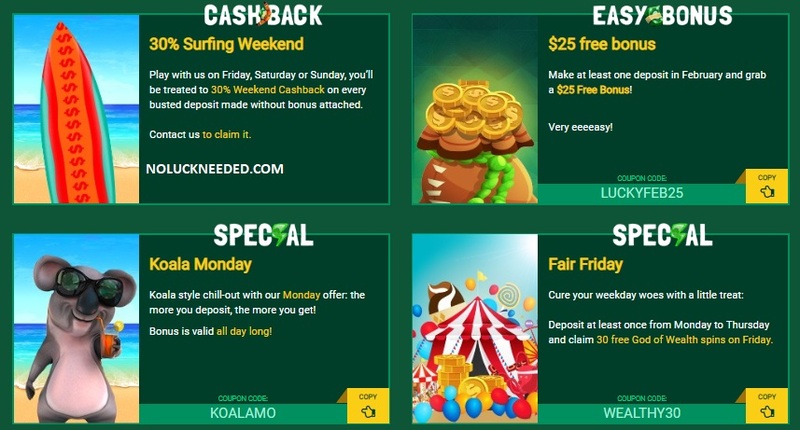 Claim your 30 Friday Free Spins for the of Wealth Pokie at Fair Go Casino!